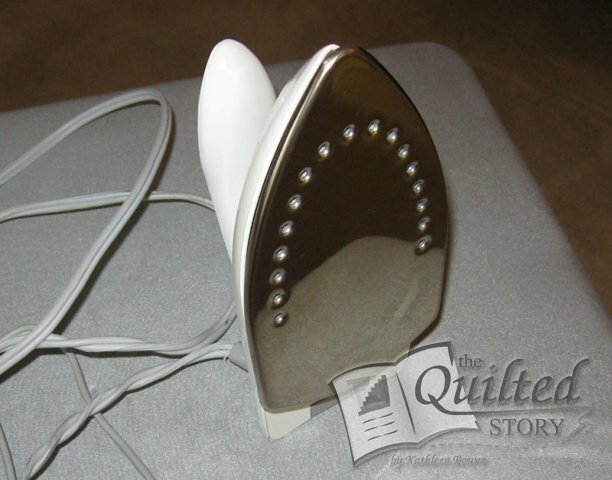 Don't you just love when your iron is "brand new" and you haven't made that mistake of ironing over some kind of fusible product...you know...on the WRONG side? I may or may not have done that a few dozen times in my quilting life...perhaps you have even heard the screams coming from my home in South Carolina? 1) Your filthy sole plate on your iron...unplugged and cooled off completely! 2) One MAGIC ERASER...rinsed and squeezed out. After you have gotten the MAGIC ERASER completely wet and squeezed out...place it on your layered stack of paper towels. Now, just take your COOLED iron (that has been UNPLUGGED) and rub it over the dampened MAGIC ERASER. Continue to rub the sole plate of the iron over the MAGIC ERASER repeatedly until all of the residue has come off the sole plate and is now on the MAGIC ERASER. To get "stubborn" areas cleaner (or in the holes of the sole plate) pick the MAGIC ERASER up and scrub directly on the particular spot that needs more attention. The picture here is my little "old" travel sized Rowenta iron that has seen better days...matter of fact just before I took this picture I had dropped the iron onto the carpet and a sticky residue stuck to the bottom of the sole plate (no undoubtedly from the synthetic fibers found in most carpeting). Look how pretty it is now that I have used the MAGIC ERASER to clean it! Do you have one of these accessories for your sewing machine? 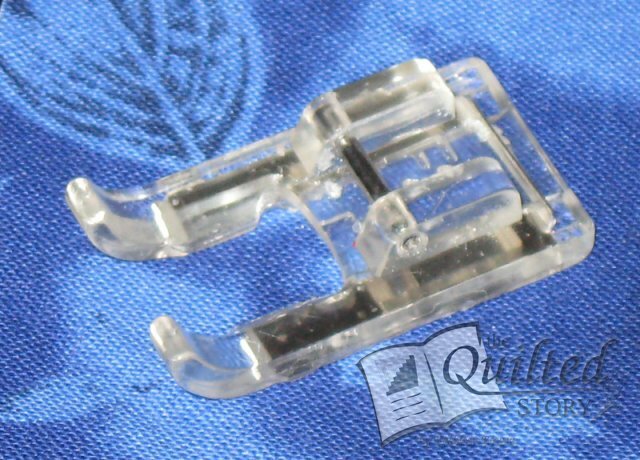 It's called the OPEN TOE FOOT and is very much like the all purpose foot that comes standard with your machine with the exception of having all of the center removed for 100% visibility while sewing. I consider this foot an essential to my successful quilting career...I actually field tested it years ago. Be sure to click on the picture so that you can see a larger view of it and get a better feel for what it really looks like. When I am teaching any class that involves paper piecing or machine applique I request that my students have this particular foot for their machine on the day of class. The difference in success for the student during one of these type of classes is unremarkable. Some people are under the impression that there is no difference from one accessory foot to the other...but there really is! My students are always pleasantly surprised as to how incredibly valuable this foot really is. No matter what brand of machine you have it is likely you will be able to get one of these for your favorite machine. They even make several different UNIVERSAL open toe feet that will fit lots of machines that may not have one considered "standard" for yours. Be sure to check with your sewing machine dealer and request one of them for your very own...you certainly won't be disappointed! PS...Michelle...don't worry, I will go ahead and order one of these little gems for the sewing machine you DON'T have! HA!